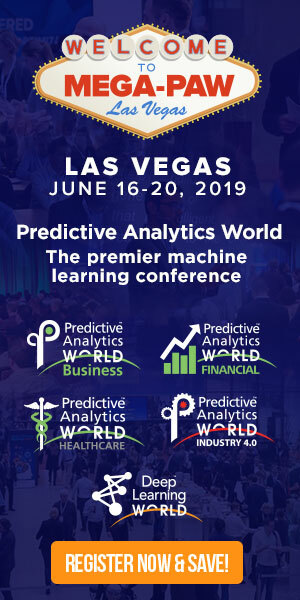 For more applications of predictive analytics from the New York Times, attend the keynote presentation from Chief Data Scientist Christopher Wiggins’s at Predictive Analytics World for Business, Sept. 27 – Oct. 1, 2015 in Boston. Use code PATIMES15 for 15% off your conference pass! The bot, named Blossom, helps predict how stories will do on social and also suggests which stories editors should promote. The New York Times publishes more than 300 stories each day. Which ones should editors feature on its many social media channels? While the humans behind the Times’ social media accounts have refined their voice and craft, the process of handpicking which stories to feature can still be laborious and involves quite a bit of trial and error. Only around 50 stories make it to the Times’ main Facebook page each day, for instance (even fewer on weekends). A new tool built by the Times’ data science team is trying to remove some of the guesswork involved in finding the right story to post to social. Blossom, an intelligent bot within the messaging app Slack, predicts how articles or blogposts will do on social and also suggests which stories editors should promote by drawing from enormous stores of data, including information on story content and performance metrics such as Facebook post engagement. Blossom can also show the basics of where posts have already appeared and how they are currently performing. At the moment, social media editors — and, really, anyone else within the Times newsroom who uses Slack — can query Blossom via a direct message or in a Slack channel to figure out which story to post to Facebook. 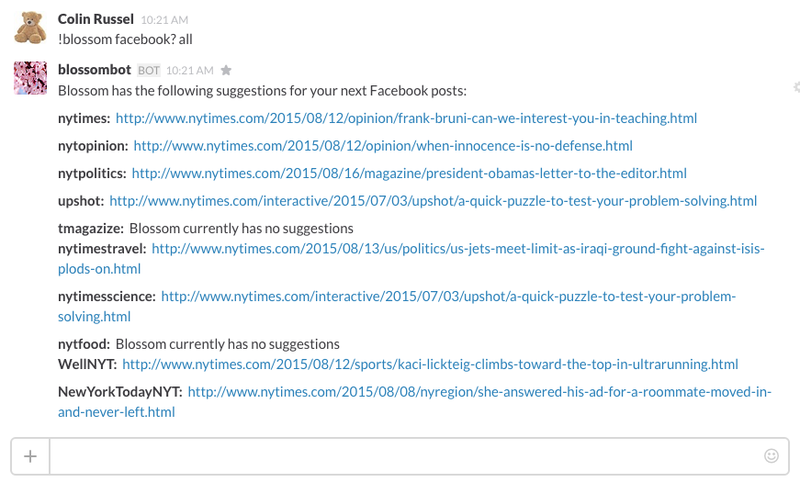 “Blossom Facebook?” editors can ask in Slack, and receive answers about what might do well there. The bot also includes some “Easter egg” features (such as weather) to encourage Times editors to explore and get familiar with the tool. The backend of Blossombot is “pretty advanced machine learning” involving Java, Python, and MapReduce, and the front end is “a really friendly chat bot,” Times chief data scientist Chris Wiggins told me. The idea for Blossom came out of discussions with Alexandra MacCallum last fall after she was named as assistant managing editor, overseeing audience development and outreach. Part of her team’s job is to craft promotion around a story after it goes live online, but with hundreds of new pieces published each day, finding the most effective way to promote stories was a daunting task. With Blossom, a social editor thinking about promoting a specific Times story can ask what’s been happening with that story in terms of social engagement, or else ask for some predictions. At the moment Blossom’s main focus is on the Times’ Facebook and Twitter accounts, though it could eventually expand to cover all the social platforms on which the Times publishes. Francesca Barber, a growth editor on the International Desk, serves as a sort of product manager, helping Russel figure out which of the many features requested by different desks at the Times to prioritize.